My wheels are original and had many layers of rusty paint. I took them out the Air Base and took the tires off and sandblasted away the years of wear; cost me $17 (thanks wife for being in the military!). $10 of Rustoleum and some Clear and I have a great new look. 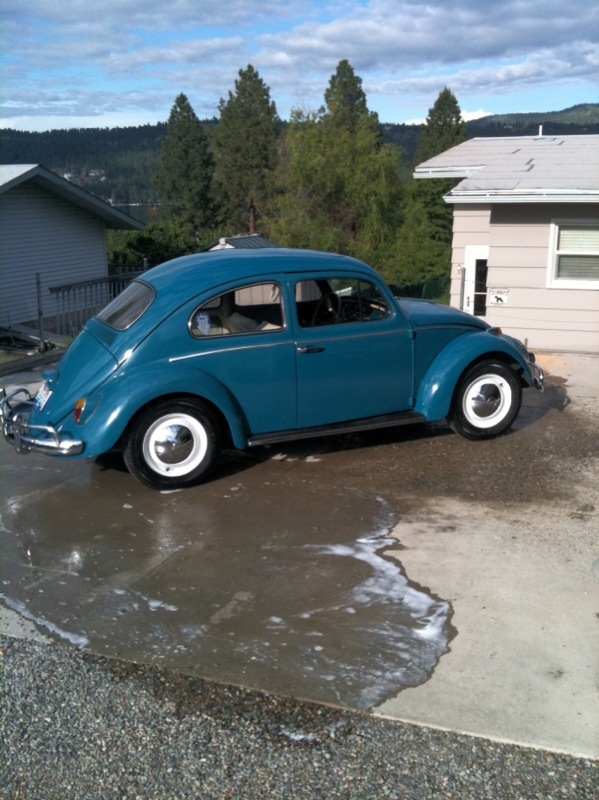 I know that OG for a '64 Sea Blue is some type of light blue/green with black hubs. I just didn't have the patience for it so I went white. I took the tires and newly painted wheels to Chris Clark @ Lloyds Automotive in Spokane Valley where I take all my stuff to have them mounted. I was concerned about scuffing the wheels with the tire machine; so they did it the old fashioned way with tire irons. All for a very reasonable price (I just had to buy a new spare tire). Looks pretty darn good to me! Thats one thing I do miss about being in the military....the Auto Hobby Shop!